In dice rooms, we now got the /search command to search for certain terms. You can now embed polls into forum posts to ask everyone what they think of something, or to do Quests. If you're new to the dice rooms and enter a dice code without prefixing it, the system now tries to detect that and post an instructive hint. This has been in effect for a few hours now, and one of the things already going wrong is that instead of reading the message people try to vary their commands in order to make it stop popping up. For example, the prefix their plain "2d20" with spaces or change the spelling to a capital D. However, in 50% of all cases so far it seems to work, and it beats me hanging out in the lobby and giving out the instruction manually (which has become my "have you tried turning it off and on again"). People like to test the limits of the system by entering absurdly high amounts of dice to be rolled. This now results in an error. Previously, the code parser would just quietly go with the maximum number and roll that, which was more of a bug than a feature to be honest. This change goes hand in hand with printing real error messages when people use obviously screwy dice codes. I feel this is the way it always should have worked, I greatly prefer commands failing outright with a clear error message instead of systems trying to fuzz their way out of faulty input. You could be even more strict, in fact. 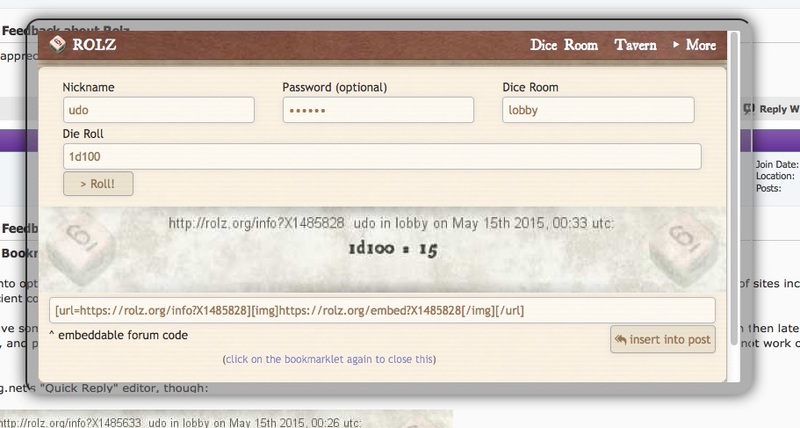 Users of the legacy rooms are going to love this new option: "clear input with # after die roll". This means after you send a die roll to chat, the input element will start over with the dice-rolling prefix already in place. There are many who say all they use the dice rooms for is rolling, but there are equally as many (if not more) users who also use it to chat just as much or even chat more than they roll. Hopefully this new option will make things easier for both use cases. We now have private threads, both for personal note-taking (intended primarily for GMs) and threads linked to a specific dice room. This should be handy for keeping a campaign summary, handouts, and other in-game material. Hey, this is handy, I'll try that out for my group. So far the entire forum feature is a disappointment participation-wise, but I hope making it a tool for note keeping will mean at least some adoption by groups and GMs. Every dice room now has its own forum where people can post threads detailing the campaign material, character sheets, adventure notes, handouts, house rules and other things. The library also contains a section with threads that are private to each user - this should be a good place to plan campaigns and take private notes that help with gameplay. I've been looking into options on how to better integrate Rolz.org with forum play. My first instinct was to make an addon for vBulletin (since a lot of sites including this one use it), but my ancient copy of vBulletin refuses to run on a modern server so I couldn't make an addon. However, I may have something that's even better since it works in a lot of situations: a bookmarklet that you can add to your bookmarks. You can then later click on it and roll something, and paste it into the forum as you write a post. It even has an option to insert the roll result into the forum post, but that may not work on all forum software. Let me know if this works for you or if you run into issues. I've tested it with Chrome, Safari, and Firefox so far. I have no hope for mobile, and don't have a Windows machine to test it on IE right now. How do I find a specific Dice Room? Is there any way to change your profile pic? Thanks for the dice roll bookmarklet. Awesome!